Amity Wamsley, nurse navigator for Holzer Cancer Care Center, speaks with Mason County Chamber of Commerce members regarding her position at the center as well as what the center offers their patients. POINT PLEASANT — At this month’s Mason County Chamber Luncheon, members were informed on what the Holzer Cancer Care Center offers to their patients. At Holzer Cancer Care Center, patients are offered an oncology nurse navigator. Amity Wamsley, a nurse navigator at the center, shared her primary job is to educate her patients. Wamsley has worked at the center for approximately 12 years and has been a navigator for nearly two years now. During her patients’ treatments she will do regular toxicity checks on them, asking how their treatment process is going and how they are feeling. She follows up when they receive chemotherapy or radiation treatments. Should a patient be feeling ill with his or her current treatment plan, she will contact their doctor to see what they can do to prevent the patient from feeling ill.
Wamsley counsels patients through their survivorship and holds a support group on the second Thursday of each month at noon in the French 500 room at Holzer Hospital. Wamsley is also a genetics nurse a portion of her time at the center and works in collaboration with The Ohio State University (OSU) Hospital to test individuals’ genetic risk of cancer. “The cancer center itself at Holzer is, I mean for our area, a large facility that tries to offer multiple modalities to improve patient experience while they’re there,” said Wamsley. Wamsley explained those at Holzer Cancer Care Center work in collaboration with OSU Hospital for genetics testing as well as clinical trial programs. Along with a highly trained staff, the Holzer Cancer Care Center has 12 chemotherapy chairs as well as two private bays for treatments, a healing garden which includes a walking labyrinth, a reflecting pool, and benches, an appearance center, and a machine that performs stereotactic radiation therapy which is the only machine of its kind within the Ohio Valley explained Wamsley. In other chamber news, Mary Fowler discussed the upcoming travel destinations for 2019; the Mason County Community Cantata is set for the weekend of Palm Sunday, April 13 and 14, 7 p.m. at the Main Street Baptist Church; the 73rd annual Chamber Dinner is set for Thursday, April 25, 6 p.m. at First Church of God in the gymnasium; the ABM Critter Dinner is set for Saturday, April 27 from 5-9 p.m. at the West Virginia State Farm Museum; and the next Mason County Chamber Luncheon is set for Tuesday, May 28. Mario Liberatore was the emcee for the luncheon and the First Church of God Kitchen Ministry Ladies catered the meal. 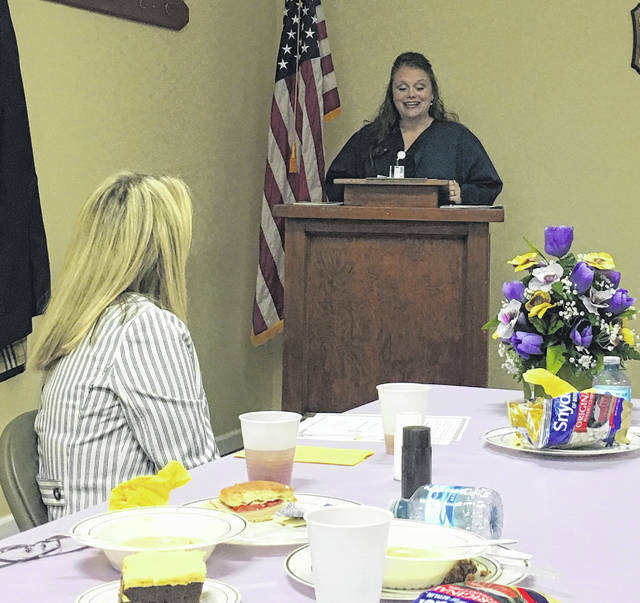 https://www.mydailyregister.com/wp-content/uploads/sites/24/2019/03/web1_ChamberLunc.jpgAmity Wamsley, nurse navigator for Holzer Cancer Care Center, speaks with Mason County Chamber of Commerce members regarding her position at the center as well as what the center offers their patients.